Brazil: Far-Right Foreign Policy Ahead? Brazilian President-elect Jair Bolsonaro appears to be moving ahead with promises to steer the country’s foreign policy in the direction of his own far-right ideology. He has accused the Workers’ Party (PT) of former President Lula da Silva (2003-10) and Dilma Rousseff (2011-16) of pursuing a foreign policy with a partisan left-wing ideology, and now he wants to “liberate” Itamaraty, the Ministry of Foreign Affairs, from what he considers an inappropriate ideological bias. Bolsonaro says that President Trump is his inspiration, his “model” of leadership, and he has made policy coordination with Washington a priority. After a congratulations call to Bolsonaro, Trump tweeted that he and the president-elect “agreed that Brazil and the United States will work closely together on Trade, Military and everything else! Excellent call, wished him congrats!” Bolsonaro met last week with Trump’s National Security Adviser, John Bolton, to discuss joint efforts to achieve regime change in Cuba and Venezuela, among other topics. Even before that, Bolsonaro had ramped up his already strong rhetoric against Venezuelan President Nicolás Maduro and reversed a long-standing policy of cooperation with Cuba, taking aim first at the 8,300 Cuban doctors in Brazil’s Mais Medicos. “We can’t allow Cuban slaves in Brazil,” he said, “And we can’t keep feeding the Cuban dictatorship.” Havana began withdrawing the doctors before Bolsonaro could expel them. Bolsonaro has barely mentioned UNASUR and is downplaying relations with Argentina, Brazil’s main strategic partner in the region, while emphasizing relations with what he calls “developed nations.” In addition to the United States, he is focused on Italy, Hungary – due to leaders’ far-right political affinities – and Israel. The evangelical political forces who backed his election are pressing him to move the Brazilian embassy from Tel Aviv to Jerusalem, respecting “a sovereign decision of Israel.” The Trump administration will warmly welcome the move, but Bolsonaro will face a potentially significant loss of trade among Middle Eastern and Asian partners. The president-elect has yet to show his hand on China – Brazil’s main trading partner – and the other BRICS countries. The Trump administration’s increasingly tough criticism of China’s activities in Latin America may temper the new government’s enthusiasm for closer ties with Beijing. Bolsonaro has taken positions that set him at odds with the rest of the hemisphere. He has denied the excesses of Brazil’s past dictatorship, advocated the use of torture against criminals whom he classifies as “terrorists,” used aggressive rhetoric against minorities (LGBTI, women, indigenous peoples, Afro-Brazilian Quilombolas, and migrants), and promised to reduce certain social rights. Brazil’s diplomatic capital as a leader on environment and climate change is also at risk due to his domestic priority to promote agricultural business and the need to preserve “total” sovereignty over the Amazon Basin at the expense of protecting the rainforest. He has cancelled Brazil’s commitment to host crucial UN climate change talks (COP25) in 2019, a deal negotiated by the government of President Temer just months ago. Bolsonaro’s choice of his new foreign minister may be emblematic of his approach to international relations. He met his commitment to choose a career diplomat, but his choice was Ernesto Araújo, an unknown who was recently promoted without ambassadorial experience who is a self-declared anti-globalist, anti-communist, and Trump’s enthusiastic “intellectual disciple.” This appointment violates the tradition, observed even during the military governments, of selecting senior, skillful, and experienced ambassadors not directly linked to any ideological trend. Further questions are raised by the military’s influence in the cabinet. Two retired generals, Vice President Hamilton Mourão and the future head of Institutional Security Cabinet, Augusto Heleno, are expected to be the president’s right-hand men. They and an empowered Ministry of Defense certainly will exercise huge influence in promoting a military vision of foreign policy in addressing issues such as borders policy and the Venezuela crisis, and could become a “second track” on Brazil’s foreign policy. * Gilberto M.A. Rodrigues is Professor of International Relations at the Federal University of ABC (UFABC) in Brazil, and was a CLALS Research Fellow in 2017. U.S. leadership in the hemisphere has declined significantly over the past two decades – manifested in Washington’s inability to implement a comprehensive environmental and energy strategy for the Americas; conclude a hemispheric trade accord; revitalize the inter-American system; and stem the rising tide of Chinese influence. In a recently published book, I argue that Washington under Presidents George W. Bush (2001-2009), Barack Obama (2009-2017), and now Donald Trump has lacked vision in Latin America and the Caribbean, and has allowed a narrow security agenda to dominate. The most noteworthy accomplishment – the assertion of central government control in Colombia – was largely bankrolled by the Colombians themselves who also devised most of the strategy to achieve that goal. President Obama’s rhetoric was the loftiest, and his opening to Cuba in 2014 changed regional perceptions of Washington. But he got off to a slow start, entering office when the United States was engulfed in the worst economic crisis since the Great Depression. His ability to devise a bold new policy for the Western Hemisphere was further stymied by an intransigent Republican majority in both the Senate and House of Representatives after the 2010 mid-term legislative elections. Washington’s inability or unwillingness to act is most obvious in four key areas. The Energy and Climate Partnership of the Americas (ECPA) represented an opportunity for leadership on environmental issues. The United States proposed many ECPA initiatives but did not fund them, expecting the private sector or other governments to step up to the plate – which failed to happen in any significant manner. Failure to ratify the Kyoto Protocol or enact meaningful national climate change legislation also undermined its moral authority on the issue. Carbon offset programs would have provided an important boost to ECPA. Although the United States played a predominant role in devising the parameters for a Free Trade Area of the Americas, its own positions caused it to fail. It refused to give up the options to re-impose tariffs in response to alleged dumping even if there were alternative means (such as competition policy) to redress the impact of unfair trade practices. Washington kept discussion of the highly distortive impact of its agricultural subsidies out of the talks. As a result, the United States was unable to offer meaningful concessions. The Organization of American States (OAS) has also been a victim of U.S. neglect. Washington has pulled back from exerting leadership and, on occasion, has delayed payments of its dues. The most effective component of the inter-American system relates to the promotion and protection of human rights, but the U.S. Senate has never ratified the American Convention on Human Rights. The United States also rejects the binding character of decisions from the Inter-American Commission on Human Rights, opening the way for governments with deplorable human rights records to question its work. Latin American and Caribbean governments have also shown enthusiasm for forming alternative institutions to the OAS, such as the Community of Latin American and Caribbean States (CELAC), which purposefully exclude the United States. China is now the largest trading partner for many South American nations, and it could conceivably replace Washington’s influence and leadership in at least some areas, including models for economic and political reform. The boom in South American commodity exports to China allowed governments to build up their reserves, pay off debts, and liberate themselves from dependence on multilateral lending agencies centered on Washington. Chinese banks now contribute more money, on an annual basis, to economic development projects in Latin America and the Caribbean than do traditional lenders such as the World Bank and the Inter-American Development Bank. Moreover, this lending comes free of the conditionalities often attached to capital provided by Washington based multilateral institutions. China’s role in building ports and telecommunication systems gives it an intelligence advantage, and arms sales have given China military influence as well. While broad policies and political commitment behind them have been lacking, Washington has run a number of security programs in the region. This focus, however, has often turned out to be problematic. The Mérida Initiative, the Central American Regional Security Initiative (CARSI), and the Caribbean Basin Security Initiative (CBSI) did not resolve the myriad root causes of the drug trade and escalating violence in the beneficiary countries. They were myopically fixated on a narrow, short-term security agenda with precarious and uncertain funding streams. While Pathways to Prosperity and 100,000 Strong in the Americas exemplify American liberal idealism at its best, the lack of an overarching sense of purpose and political consensus behind them have led to both being woefully underfunded. A vision for the Americas doesn’t guarantee Washington will have positive influence, but the lack of one will indeed prolong its decline. *Thomas Andrew O’Keefe is the President of Mercosur Consulting Group, Ltd. This article is based on his new book, Bush II, Obama, and the Decline of U.S. Hegemony in the Western Hemisphere (Routledge, 2018). Obama and Colombian President Santos announced the new program in Washington events marking the 15th anniversary of the launch of Plan Colombia. Amid the many remarks about Colombia’s progress, indicators such as homicide rates (down 50 percent since 2002), kidnapping rates (down 90 percent), economic growth (averaging 4.3 percent), and poverty and unemployment (down slightly) stand out. By most accounts, moving around core regions of Colombia is easier and safer than it’s been in decades. Some of these gains of the past 15 years remain tenuous, and “Peace Colombia” will face new challenges as well. In speeches and backgrounders, government officials have acknowledged that coca eradication and crop substitution programs have failed to reverse Colombia’s role as the world’s biggest producer of coca. Moreover, programs supporting the demobilization of the FARC will be more difficult to implement than those given to the rightwing paramilitaries in 2002-2006. Tens of thousands of former paramilitaries are now active in bandas criminales (BACRIMs), which President Santos recently referred to as “2,500 miniscule criminal organizations scattered throughout the country.” Changing economic circumstances could also complicate efforts to advance peace. During the years of Plan Colombia, the country got a healthy bump from both domestic and foreign investment – because of the improved security environment as well as the external economic environment, including the U.S.-Colombia Free Trade Agreement and Chinese demand for commodities. Investment remains strong, but the export boom is over, which is lowering growth and squeezing government budgets. The creation of economic opportunity is at least as important to the success of Peace Colombia as continued support for the Colombian military and security system, although last week’s speeches and press releases did not shed much light on that. Achieving peace and building democracy will also require addressing infrastructure deficits, educational inequality, inadequate job training, and poverty. Several Florida congressmen, arguing that “Peace Colombia” supports an accord that’s overly generous to the FARC, say they’ll oppose Obama’s pledged aid. The assistance will almost certainly advance, however, because of the strong Washington consensus that Colombia is its biggest (if not only) success worldwide in beating back irregular armed groups. Moreover, as President Santos and U.S. Secretary of State Kerry emphasized in a press conference, there are no conditions on the new assistance – which should assuage Congressional opponents’ concerns that the relationship will get held up by investigations into alleged human rights violations in the past. The Presidents spoke of pulling Colombia back from the “verge of collapse” in the 2000s to the “verge of peace” now. A broadening of strategies in both capitals, including a reassessment of the emphasis on military options, could push the country toward becoming a more inclusive democracy, which ultimately may be what is required in order to achieve lasting peace. Although questions continue to swirl around whether the Chinese-Nicaraguan canal – which its main investor called the “most important [project] in the history of humanity” – will be built or not, its opponents are taking it all very seriously. A CID-Gallup poll in January showed that 41 percent of Nicaraguans interviewed strongly support the project, while another 21 percent and 17 percent back it somewhat and a little, respectively. But another poll by the same firm suggested ambivalence: asked if they supported the National Assembly vote giving the Chinese firm leading the project, HKND, a concession for the 278-km right of way for up to 100 years, some 39 percent of respondents said no. Some political voices are growing more sharply opposed as well. The powerful business group COSEP, for example, has gone from agnosticism about the project to a position of open disapproval. Groups concerned about the project’s impact on the environment and rural residents have already held protests involving up to several thousand participants, and – despite the government’s promise that the canal will bring prosperity throughout the country – organizing efforts appear unlikely to fade. Skepticism about HKND and the government’s commitment to protecting the environment, fueled by their off-the-cuff dismissal of concerns, is so deep that even a balanced comprehensive impact study by the British Environmental Resources Management, due next month, may fail to calm nerves. Environmentalists cite studies warning that dredging Lake Nicaragua from its current depth of nine meters to the 27 meters necessary for cargo ships will stir up many layers of toxic materials, with catastrophic consequences for marine life and surrounding agricultural areas. Other groups are rallying behind the 29,000 residents who are to be evicted from properties along the canal route. Demonstrations have turned violent, with protestors injured by tear gas and rubber bullets. Graffiti and banners demanding “fuera chinos” are common. In the hemisphere’s second poorest country, the promise of growth spurred by the $40-50 billion project is still a powerful card in the government’s hand. Many skeptics still wonder, however, if the whole scheme is a ruse to fleece the Chinese investors, who’ll bring in a couple billion dollars before realizing that the project will get bogged down in Nicaraguan political quicksand. 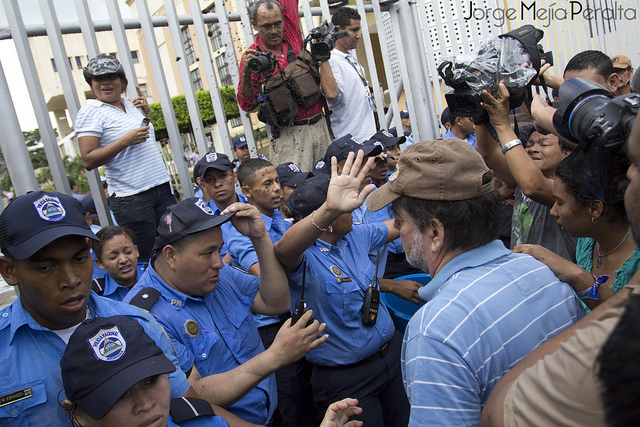 But opposition to the canal goes far beyond the usual Managua political game of fighting over corruption dollars and obstructing each other’s priorities. President Ortega’s endorsement of the canal contradicts his own statements years ago that he wouldn’t compromise the lake’s eco-system “for all the gold in the world.” According to The Guardian newspaper, the dredging will move enough silt to bury the entire island of Manhattan up to the 21st floor of the Empire State Building – which no one is prepared to deny will have serious environmental implications. China’s Three Gorges Dam, completed five years ago, displaced 1.2 million inhabitants – proportionally twice as many Nicaraguans displaced by the canal – but Nicaragua’s ability to resettle them, give them jobs, and suppress their dissent is small compared to China’s. The project may not be the greatest in the history of mankind as HKND claims, but it may provoke a crisis as great as any in Nicaragua. For starters, if COSEP’s opposition persists, it threatens to unravel the modus vivendi under which Daniel Ortega has stayed in power, and could portend much deeper tensions. Click here to see our previous article about the canal. China in Latin America: Is the Dragon Here to Stay? Source: Based on Gallagher et al. (2012). As China has become a major importer of Latin American & Caribbean commodities, it has significantly increased its financing and investment in the region. Data on Chinese investment is not complete, but we estimate that it reached 38 percent of the combined financing from the IDB and World Bank to the region during 2005-11, with Venezuela getting the most. In 2010 China became the third largest outside investor in the region (behind the United States and the Netherlands), and it provided an estimated $22 billion in 2011 – approximately 13 percent of total investment flows to Latin America and the Caribbean. This investment is likely to continue to grow. The Chinese government provides tax breaks, lines of credit and other incentives for companies to invest in key industries overseas, and a great deal of its lending corresponds to “finance for assured supply,” such as a $10 billion loan from the Chinese Development Bank to Brazil’s Petrobras in 2009 in exchange for 200,000 barrels of oil per day. Currently, according to Gallagher et al. 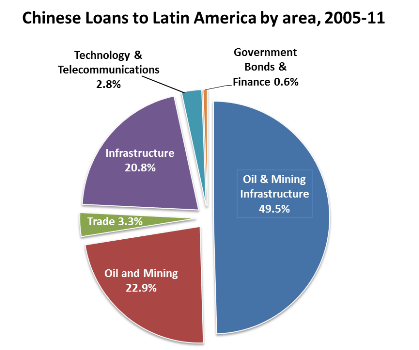 (2012), 72 percent of the Chinese lending to the region is in the oil and mining industries and in related infrastructure projects. The remaining funds lent in recent years have gone towards other infrastructural developments (21 percent), and towards trade, finance, and communications (7 percent). Latin American countries have implemented policies aimed to attract Chinese investment. They generally impose fewer conditions than those demanded by international financial institutions and require less compliance with environmental standards. Recent surveys indicate that citizens overall view the growing influence of China in the region as a positive thing. Indeed, Vanderbilt University’s AmericasBarometer found in 2012 that 20 percent of respondents viewed China as already the most influential country in the region, and an average of 63 percent said it had a positive influence. However, respondents see China as less trustworthy than the United States. Across those nations polled, roughly 38 percent viewed China as “very trustworthy” or “somewhat trustworthy,” whereas 45 percent had similarly positive views of the United States. Although the growing Chinese investment and trade may give Latin America and the Caribbean a great opportunity to generate growth, there are several challenges. If Chinese participation in the mining and oil industries results in environmental degradation, indigenous rights advocates and community organizations already skeptical of commodity driven growth will increasingly confront Latin American states as well as foreign enterprises. In addition, Chinese concentration in the commodities industries has generated strong structural changes in Latin American economies, further relegating manufacturing to a secondary role and raising the possibility of Dutch disease, in which high commodity prices harm other exports by reducing the country’s competitiveness. It has become commonplace to observe that South America is building a 21st century economy on a 19th century logic of primary product exports. A third concern is that, since Latin America as a region is the smallest recipient of Chinese investment in the world, China will turn elsewhere if governments start putting conditions on Chinese projects. Ultimately, these concerns make a strong case for Latin American countries to cultivate stronger ties with the Chinese economy while remembering that China’s strategic interest in extractive industries may collide with each country’s own development strategies. ECLAC. 2010. “Chapter III: Direct investment by China in Latin America and the Caribbean.” In ForeignDirect Investment in Latin America and the Caribbean. Retrieved November 2013, from http://www.eclac.cl/publicaciones/xml/0/43290/Chapter_III._Direct_investment_by_China_in_Latin_America_and_the_Caribbean.pdf. Faughnan, Brian M. and Elizabeth J. Zechmeister. 2013. “What do Citizens of the Americas Think of China?” AmericasBarometer: Topical Brief, June 13. Gallagher, Kevin P., Amos Irwin, and Katherine Koleski. 2012. “The New Banks in Town: Chinese Finance in Latin America.” In 30 Years of Inter-American Dialogue Report: Shaping Policy Debate for Action. Zechmeister, Elizabeth J., Mitchell A. Seligson, Dinorah Azpuru, and Kang Liu. 2013. “China in Latin America: Public Impressions and Policy Implications.” Presentation of the LAPOP. Graphic: Summit of the Americas organization; public domain. 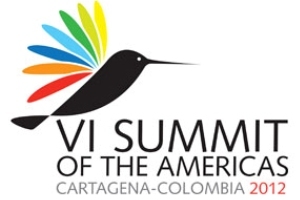 The real news at the Summit of the Americas in Cartagena, Colombia, in April was the dissonance between the Obama administration – with its sincere but content-free rhetoric of partnership – and Latin American leaders across the political spectrum, even among the friendliest. This was in sharp contrast to the Summit in 2009, when the region was palpably excited about the new American President. This year, press reports portrayed President Obama as unaware that the hemisphere is changing, and noted that he oddly said that criticism of U.S. policy was reminiscent of the Cold War, while he put himself out on the fragile limb of defending a Cuba policy rooted in, precisely, the Cold War. Most observers in the region judge that the main takeaway from Cartagena is that while Washington offers little and listens less, Latin America is moving away. Over the past decade South America has sustained rates of economic growth higher than any since before the oil shock of 1973, and the U.S. is hardly an unchallenged source of trade and investment. (Chinese and EU trade with South America has surpassed that with the United States.) Chavez’s aid to Cuba and Nicaragua far exceeds Washington’s meager offerings to even best friends like El Salvador. The Brazilian National Development Bank, BNDES, provides more loans in the region than the World Bank and Inter-American Bank combined. Americans’ fascination with the Cartagena prostitutes dwarfs interest in the lessons of the serious regional dynamics that played out in the Summit. Whether U.S. political leaders and pundits acknowledge it or not, failure to dialogue seriously with neighbors about the 50-year effort to change the Cuban regime or the failure of the 40-year “War on Drugs” will have consequences for the United States. Washington rejects the region’s efforts to re-think issues, such as the wisdom of the current approach to narcotics, at its peril. Central America was an unhappy front-page story in the 1980s and now threatens to reemerge as a major headache because of domestic crime (fueled by U.S. deportations) and the drug trade – while Washington fiddles with time-worn formulas and programs. The Obama Administration still has time to make good on its pledge of “partnership” and get serious about listening to and working with our neighbors.